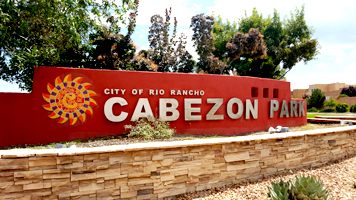 Largest of the neighborhood recreational areas is Cabezon Park, located off of Cabezon Blvd. south of the Astante’ neighborhood and east of the Arbolera de Cabezon neighborhood. The 13 acre dog-friendly park is adjacent to the Cabezon Community Center which has a seasonal in-ground swimming pool. The grass park features shade structures, children’s playground, BBQ grills, picnic tables and a .63 mile walking loop. Pet Parades, Movies Under the Stars, Kamp Rio and Rio Rancho’s Largest Yard Sale, are just some of the events that are hosted at Cabezon Park.